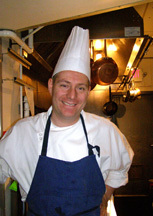 Chef/Owner Tim Wiechmann of T.W. Food in Cambridge, Massachusetts shares his culinary vision and three inspired recipes that showcase the style of the restaurant, including his take on Scotch and Cigars. When I met Chef Tim Wiechmann at his restaurant in October 2008, I was definitely impressed with his background of having lived in Switzerland, Austria, Germany, France, and the United States, combined with travels to Japan, Korea, South America, and North Africa. His diverse background brings a broad spectrum of ideas and cultures that he deftly melds into his cuisine with French methodology to bind it together. His vision is that it is important to present food correct to nature, that is true to the season, well researched and very anti-industrialized, and with colorful representations of ideas. He works closely with the farmers who supply the restaurant, the bread is from his best friend's bakery, and the flowers are sometimes from his Godmother's garden. 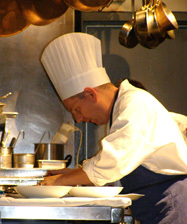 He combines skills that he learned from having graduated from L'Ecole le Cordon Bleu in Paris with a diploma in cuisine and pastry, attending Academie Lenotre in Paris for ice cream and chocolates, University of Vermont with a degree in literature reading European and American literature, Aiglon College in Switzerland, apprenticing with some of the top toques in the world namely Chef Alain Soliveres (Taillevent, three-star Michelin restaurant, Paris), Chef Phillippe Legendre (Georges V, three-star Michelin restaurant, Paris), Chef Alain Passard (L'Arpege, three-star Michelin restaurant, Paris), Chef Joel Robuchon/Chef Eric Lecerf (L'Atelier de Joel Robuchon, one-star Michelin restaurant, Paris), and Chef Jenny Jacquet (La Truffe Noire, one-star Michelin restaurant, Paris), and working at Boston restaurants: Ten Tables Restaurant, Restaurant Aujourd'hui at the Four Seasons, Lumière Restaurant, and Sel del la Terre. Having his own restaurant now allows him to cook what he wants and to make his own individual artistic statement, which is something that has always been important for him, where he can write his own stories. His artistry also finds expression in music, having once worked as a professional Jazz guitar player for many years while he was cooking. Together with his wife, Bronwyn, he has created T.W. Food where the ambience in the attractive, intimate restaurant is welcoming and the artful presentation of the cuisine equally matches the creative flavors. He graciously shares three of his inspired and tasty recipes to tease your taste buds until you can make a reservation at T.W. Food. Bon Appetit! Method: Split the lobe in 2 parts, weight should be about 10.5 ounces (300 grams) and about 15.8 ounces (450 grams). Slice the larger half into thick ½ inch (1.2 cm) slices. In a small tabletop smoker (like a Cameron's), smoke the thick slices of foie gras for 5 minutes over medium heat/smoke. Remove and quickly pan sear the slices until they are cooked to medium. Pour the mixture into Cappuccino cups and bake in a bain-marie at 300° F (149° C) until the custard has set. Cool. 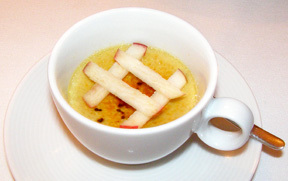 To serve, sprinkle the crèmes with sugar and burn with a propane torch. Thinly slice the apples and mount into the crème, and serve with toast. Method: Combine 8 eggs with 4 yolks. Discard the egg whites (or use for another recipe). Blanch the parsley including the stems in salted boiling water for 1 minute. Quickly transfer to a blender, add 2 ice cubes, olive oil, and salt. Blend to a thick purée. Melt butter in a high rim saucepan, add the egg mixture and whisk vigorously over medium low heat. The mixture will set up slowly. Do not allow thick curds to form on the bottom or sides of the pan. The eggs should curdle to small grains. At this point, move the pan off the heat and add the heavy cream to cool the mass and stop any continued cooking. Taste and season accordingly. 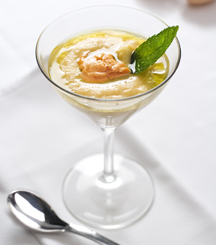 In a deep bowl, cup, or martini glass, spoon the parsley purée into the bottom. Cover with the eggs, add a dollop of the sea urchin roe, and serve. 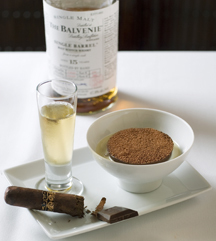 A new take on Scotch and Cigars with a lush chocolate, custard imbibed with crème anglais perfumed with tobacco, and a side sipping syrup flavored with your favorite single malt scotch. Method for Mousse Cakes: Place gelatin in cool water to hydrate. In a heavy bottom saucepan, whisk together milk, egg yolks, and sugar. Heat the mixture over medium heat until the milk is steaming, but not boiling, whisking constantly (180° F/82° C). Turn the heat to low and stir in chocolate. Immediately remove the pan from the heat. Squeeze gelatin leaves to remove any water. Place the gelatin into the hot chocolate mixture and whisk until gelatin is completely dissolved. Whisk in the vanilla extract. Chill well. Using a whisk or the whisk attachment on a mixer, whisk the heavy cream until soft peaks form. Take approximately ¼ of the whipped cream and stir it into the chilled chocolate mixture to lighten. Pour the lightened chocolate mixture gently into the remaining whipped cream and gently fold until combined. Pour chocolate mousse into 6 plastic lined molds or ramekins. Method for Tobacco Sauce: Combine all ingredients in a heavy bottomed saucepan and heat over medium heat to just under a boil, whisking constantly. Immediately remove from heat and pass through a fine sieve. Chill. Method for the Syrup: Combine sugar, water, and whiskey in a saucepan. Bring to a boil, and let bubble for about 1 minute. Take the mixture off the heat and cool to room temperature. Serving Presentation: Pour Tobacco Sauce in a bowl, place a mousse cake in the center, and serve the Whiskey Syrup on the side, or poured over the mousse cake. The restaurant features two Grand Tasting Menus, one of which is an inspired Vegetarian Menu in addition to the à la carte menu. Dinner is served Monday - Saturday from 5:00 pm - 10:00 pm, and on Sunday from 5:00 pm - 9:00 pm. Reservations strongly recommended. Read more about T.W. Food in the Restaurants section.